Want an Official GTS Scarf? Winter is coming! Wouldn’t it be nice to keep warm with an official GTS scarf? The scarves were the idea and work of the Classes of 2007 and 2008. Based on the traditional academic scarves of the UK (made famous by the Universities of Oxford and Cambridge, as well as the Harry Potter series), GTS scarves were designed and manufactured by Luke & Eyers, a firm in Cambridge, England. In a process that took several months, the Classes of 2007 and 2008 reviewed over a dozen color schemes and multiple sample designs. A rich blue stripe was taken from the GTS banner that is used at Commencement and other Seminary processions; this is offset by white stripes. 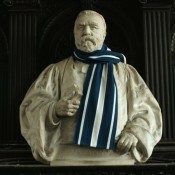 The seven-stripe design is similar to the scarf style of Jesus College, Oxford, founded in 1571. The GTS scarf is made of 100% double-ply, light virgin wool. Scarves are available to purchase for $50 + $5 shipping if mailed out. Please make checks out to: The General Theological Seminary. For more information, to see a sample, or to buy a scarf, please contact Jonathan Silver or Donna Ashley.